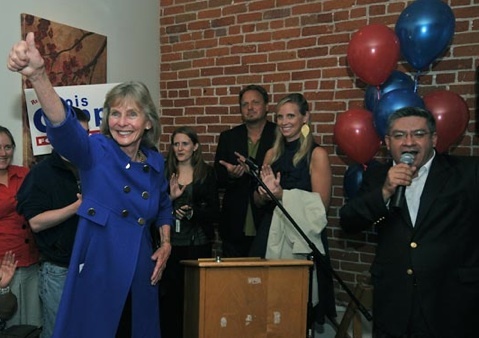 County Supervisor Salud Carbajal (right), here introducing Rep. Lois Capps (left) at her 2010 victory party, has received Capps's nod in the race for the 24th Congressional District seat. One year from today, on June 7, 2016, we will be heading to the polls for California’s primary election. And a year from today, I will proudly be casting my ballot for Salud Carbajal for Congress. I’ve known Salud for more than 20 years, and he is the best choice to represent our wonderful Central Coast in Congress. Being your Representative is a job I know well, and Salud is a public servant I know equally as well: first as the dependable aide to the treasured Naomi Schwartz and then as our County Supervisor. As the son of immigrants, Salud has dedicated his life to serving our community and country both in the military and in local government. His leadership is defined by two strong and vital characteristics — knowing how to forge consensus and knowing what it truly means to serve the people you represent. It’s no secret that Congress is a difficult place to be right now. The polarizing forces are strong, and inaction is often an easy answer for too many. To be successful you must have the ability to build personal relationships that translate into achieving the art of the possible. Salud has proven over the years that he can do just that. He has shown time and again that he is willing to listen, that he is willing to work together, and that he can find the common good in people to settle differences in a civil manner. Whether serving in the minority or majority as I have, a Representative must never lose sight of the heart of the job — serving your constituents who have needs that vary from bureaucratic to life changing. While that work rarely earns headlines, it is the crux of the job and by far the most rewarding aspect. One of the things that has impressed me most about Salud is how much gusto he brings to this part of the job — being responsive to the needs of the people he serves. He is in tune with the community and works hard to deliver for us, in a way that is not polarizing. I know he’ll work even harder for us in Washington. I believe that with Salud as our Congressional Representative, the Central Coast will always have a strong voice in our nation’s Capital. That is because he also understands the many challenges facing the families of the Central Coast. He understands them because they are challenges he and his family have faced, and overcome. His father came here from Mexico to work in a copper mine and later the fields of Oxnard so that he could forge a better life for his family. As a boy, Salud helped his family while excelling in school and setting his sights high. He has a track record of ensuring that all kids can have the kind of opportunities he seized as a child. When I was a school nurse, I saw firsthand the commitment he carries for improving the lives of at-risk youth in our community. And I’ve admired his leadership on the Children’s Health Initiative to make sure children throughout Santa Barbara County have access to quality health care. If Salud is elected to represent the 24th District, I know he will carry forward the values that we share. He understands that we must protect our beautiful coastline in the aftermath of the biggest oil spill in 50 years. As the son of an immigrant, he will fight for comprehensive immigration reform so that millions of people no longer have to live in the shadows. He will work to protect Social Security and Medicare. He will fight for access to quality, affordable education, and continue to work to grow the economy by supporting our community’s small businesses. And he will protect a woman’s right to make her own personal health-care decisions and fight for gender equality in the workplace. I believe that Salud Carbajal is and will be the kind of leader who will be steadfast in his service to the Central Coast, and to this great nation of ours. And that is why he has my vote to be the next member of Congress from the 24th District.